Yoga helps to strengthen our bodies and steady our minds, allowing us to focus and feel better. 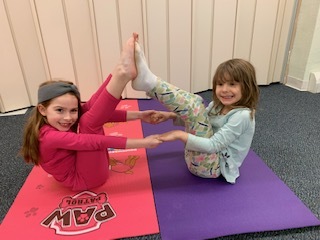 In this series, tailored to elementary school kids, students will learn how to exercise their bodies through age-appropriate yoga poses and discover ways to settle their thoughts through relaxation techniques and breath practices. Through this weekly class, kids will be given the time to play, have fun and get centered. Snack provided. Classes are taught by Yogi Jen, a certified Kidding Around Yoga instructor. This series is appropriate for elementary school children.